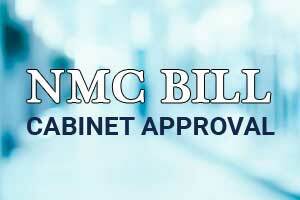 New Delhi: Following the changes recommended made by the parliamentary panel on the much debated National Medical Commission Bill, the Union Cabinet chaired by Prime Minister Shri Narendra Modi has approved certain official amendments to the National Medical Commission (NMC) Bill. 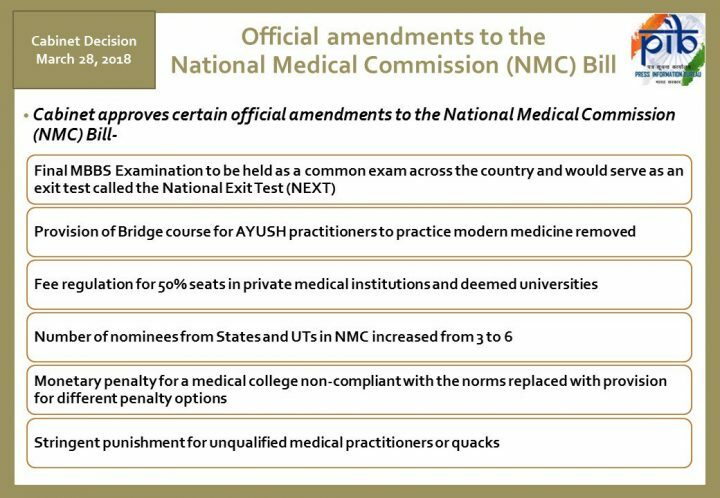 The Amendment to the NMC Bill comes in the backdrop of its consideration in the Lok Sabha on 2nd January 2018 and subsequently being referred to the Department Related Parliamentary Standing Committee (DRPSC). The Government has considered the recommendations made by the Standing Committee in its report tabled in the House on 20th March 2018 and general feedback, particularly the views of medical students and practitioners regarding certain provisions of the Bill. Final MBBS Examination to be held as a common exam across the country and would serve as an exit test called the National Exit Test (NEXT):Having considered the common demand by the students not to subject them to an additional licentiate exam for the purpose of getting license to practice, the Cabinet has approved that the final MBBS examination would be held as a common exam throughout the country and would serve as an exit test to be called the National Exit Test (NEXT). Thus, the students would not have to appear in a separate exam after MBBS to get the license to practice. NEXT would also serve as the screening test for doctors with foreign medical qualifications in order to practice in India. Fee regulation for 50 percent seats in private medical institutions and deemed universities: The maximum limit of 40 percent seats for which fee would be regulated in private medical institutions and deemed universities has been increased to 50% seats. Further, it has been clarified that the fee would also include all other charges taken by the colleges. The number of nominees from States and UTs in NMC increased from 3 to 6: Responding to the demands from States to increase their representation in the NMC, the nominees of States and UTs in the NMC have been increased from 3 to 6. The NMC will comprise of 25 members of which at least 21 will be doctors. Monetary penalty for a medical college non-compliant with the norms replaced with provision for different penalty options Another major concern gathered during the discussion with stakeholders was the wide range of monetary penalty, ranging from one half to ten times the annual fee recovered from a batch, to be imposed in a graded manner on a medical college non-compliant with the norms. The clause has been replaced with a provision which provides different options for the warning, reasonable monetary penalty, reducing intake, stoppage of admission leading up to the withdrawal of recognition. Stringent punishment for unqualified medical practitioners or quacks: The government is concerned about the quality and safety of healthcare being made available to the citizens and the need to act strictly against unqualified practitioners or quacks. The punishment for any unauthorized practice of medicine has been made severe by including a provision for the imprisonment of up to one year along with a fine extending up to INR five lakhs. NMC should give consideration about FRA pan india so that it will decide the fees of any particular curriculam…2nd Standard and Strict quality Regulation athority for medical education. We appreciate government effort to keep DNB MD equivalence in all respect including teaching post in medical college. This is wonderful decision of government. DNB is equivalent to MD in all respect as both entry and exit examination of DNB is fair and transparent with four external eexaminer are not known to DNB candidate. DNB has got a full curriculum for teaching in every aspect of concerned specialty. We appreciate the decision of government. how it will be equal,when there is a separate entry exam .IN SO MANY WAYS THEY ARE DIFFERENT.IF THE DEMAND IS FOR EQUIVALENT THEN WHY THERE WIII BE SEPARATE ENTRY AND EXIT EXAM.LET DNB WILL BE ABOLISHED FOR ALL PURPOSES. The whole medical education in our country lacks merit. In Central and State government colleges it is caste and community consideration and quotas. A Indian tribal living in Nagaland or a Jharava tribal of Andaman Islands is deemed more fit to be a doctor in India by law. In private and Deemed medical colleges, its the exorbitant fees of Rs.15- 25 lakhs/ annum is the cut off for admission. Hence corruption is the core activity of medical education and practice. That is why all top politicians and govt employees seek medical attention only from USA or Europe. They avoid Indian healthcare facility. Are u sure DNB equivalent to MD for all purposes including for teaching post ?? Since government has taken stand for DNB qualification as mentioned in the bill and does not talk about parliamentary committee decision. This means the government is planning to equate DNB with MD in each aspect.